It's officially 16' x 32' and level. We got a ton of torn bags for much less than retail at a big box store. 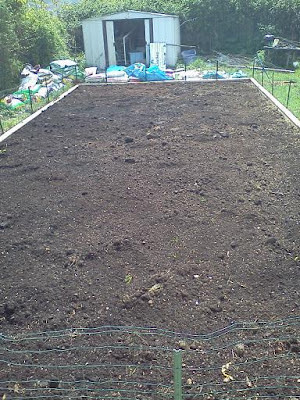 Since we have very dense, clay soil, we were going for a one big raised bed kinda thing. We filled it with lots of spagham moss, compost, garden soil and some top soil. I have very alkaline soil, so hopefully this will help. Our last frost was technically April 17, but it got cold again. I'm DYING to plant stuff, but I'm waiting. I do have peas, carrots, lettuce, mint, chives, asparagus, strawberries and blueberries that sprouted outside. Inside everything sprouted and the Jackpot Zucchini is huge. They are desperate to get planted outside, as are the bush peas. Hopefully, they can wait it out one more week...maybe two. I'm just not sure if I can!